Looking for inspiration when it comes to decorating your sash windows? Check out our stylish ideas and practical advice. If you are lucky enough to be the proud owner of a sash-windowed property you may have realised that it can be hard to dress a sash window appropriately, after all, whilst we love displaying our windows we must also retain privacy for our homes. If you’re stuck for inspiration when it comes to breathing new life into your sash windows then fear not because at Fortis & Hooke we can help. Read on below to find out the many fantastic ways that sash windows can be dressed. Interior window shutters instantly add character to a home. They can be custom made, providing a very individual addition to your windows. Shutters allow you to easily filter the light coming into the room as well as providing the option of keeping the room cool in the warmer months of the year. Londoners seem to have fallen in love with the more continental cafe style shutters, this style simply cover the bottom half of the windows, allowing for additional privacy if situated on the ground floor. Pelmets complement sash windows very well because they do a great job of maintaining the traditional atmosphere of a period property. Pelmets offer a diverse choice as they are available in a multitude of designs and finishes. It is of course important to remember to keep the pelmet short enough so that the beautiful sashes are still visible. Pelmets also provide a more stylish way of concealing curtain rails or tracks, meaning that the windows themselves are kept as the centrepiece. 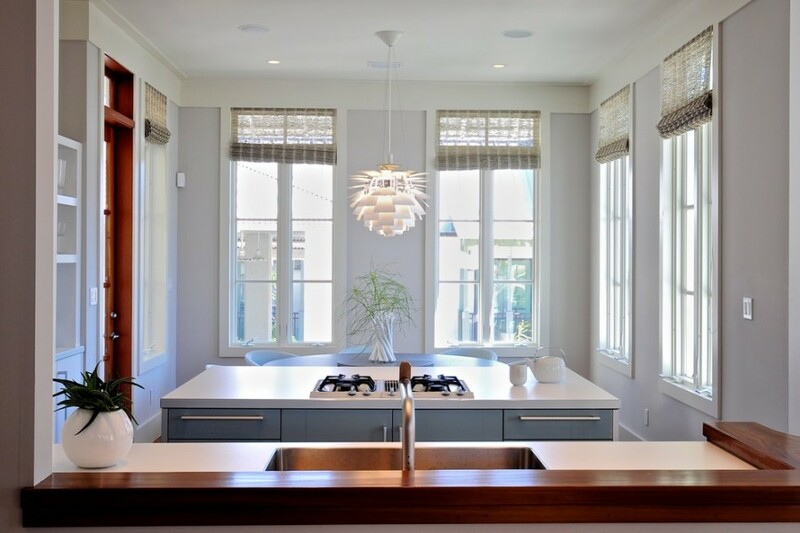 Floor-to-ceiling curtains will likely always be a popular choice for dressings windows. They provide a warm framing effect and can be used to complement the whole of the interior. Floor-length curtains are likely the most versatile of all window dressings; you can switch up the look and feel constantly to avoid becoming bored with them. You can hang them by using a modern suspension-rail or a traditional curtain pole and even add in an intricate hem; likewise you can always simply sweep them out of the way with an elegant curtain tie, allowing the focus to remain on your lovely sash windows. If you are looking for a cost effective solution to styling your sash windows, blinds are certainly going to be your best bet. Having said this, just because you can pick up some good value blinds doesn’t mean they have to look cheap! In terms of practicalities you can’t really go wrong with a set of Roman blinds, they are adjustable, meaning that you can allow more or less natural light into the room and they are always available in a wide range of shades and designs.If you are looking for a stylish way to add warmth and gravitas to a room then these are a great bet.